Struggling with rough, dry and dodgy skin and increasing pollution and rising prices are posing a threat to your beauty regime? Vitamin E oil is the solution to all your beauty issues. It is packed with antioxidants and nutrients that work wonders for your hair, skin and nail. It is light brown/reddish in color and is widely found in several skincare formulations. Vitamin E oil is easily available in liquid and in capsule form. The capsules can be punctured in order to release the oil for application. It helps in neutralizing the effects free radicals that damage the cells in body. So, now give those high-end cosmetic brands a back seat and resort to vitamin E oil for a healthy, sparkling and glowing skin. An earlier study published in the Journal of Molecular Medicine asserted that Vitamin E is the major naturally occurring lipid-soluble non-enzymatic antioxidant protecting skin from the adverse effects of oxidative stress including photoaging. The study revealed that the antioxidative and anti-inflammatory, photoprotective and anti photo-aging property of vitamin E helps in decreasing the frequency and severity of pathological events in the skin. Vitamin E acts as a wonder drug for your skin! Vitamin E acts as an excellent moisturizer for the skin and prevents dryness. Along with regulating the proper functioning of oil secreting glands in the skin, regular application of vitamin e oil leaves the skin rejuvenated and hydrated. Application of vitamin E oil also prevents the loss of water from skin and retains its oil-balance. This leaves you with a flawless, radiant and glowing skin. Vitamin E oil can also be used a night cream for those wanting to avoid oily or greasy skin during the day. Application of vitamin E oil keeps the skin soft and supple and reduces the risk for developing wrinkles on cheeks. Also, vitamin E oil safeguards the eye from dark circles by preventing excessive formation of melanin. Given below are some natural remedies exhibiting the benefits of vitamin E oil. Make sure to have a make-up free face before application. Take all the ingredients together in a bowl and mix. Apply this for about 10-12 minutes or until it dries. Mix vitamin E oil with the banana to form a paste. Rich in antioxidants, Vitamin E oil helps in fighting free radical damage that causes hyper-pigmentation on the skin leading to spots. Application of vitamin E oil initially softens and smoothens the affected area, simultaneously lightening the spots. It also helps in speeding up the process of skin cell regeneration by replacing the dead and damaged cells with the new one. This eventually helps you get rid of scars and spots. Puncture the capsules and extract oil in a bowl. Apply on skin using your fingertips. Pat your skin dry using a soft towel. Vitamin E oil leaves an amazing anti-aging effect on skin. Regular application of Vitamin E oil promotes the production of collagen and elastin in the tissues, improving the elasticity of the skin. This further helps in reducing the visibility of fine lines, age spots and wrinkles, giving you a younger looking skin. Add 2-3 drops of vitamin E oil. Let it remain for 10 minutes. Puncture the capsules to extract the oil. Add aloe vera gel or juice and mix. Gently apply the mixture on skin. 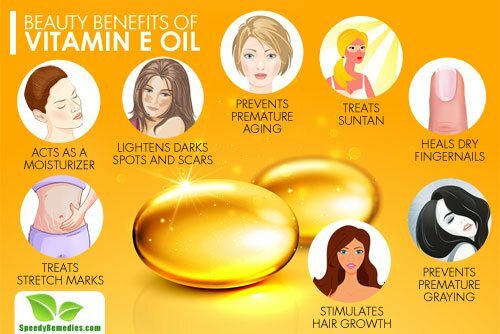 The antioxidants found in vitamin E oil work wonders in the treatment of suntan. Application of the oil neutralizes the effects of free radicals (caused by UV radiation), thus soothing suntan. This gets absorbed in the upper layer of the skin, healing the damage by ultraviolet rays. Mix vitamin E oil and lime juice together in a bowl. Take the mixture on your palm. Rub in circular motions onto burnt skin. Rinse using lukewarm water and pat dry. Bearing excellent restorative properties, Vitamin E oil helps in maintaining the health of your nails. Acting as a great moisturizer, it prevents the breakage of nail, thereby keeping them in good health. From annoying to extremely painful, hangnails could be one cause of concern for you. Vitamin E oil is specifically beneficial in the treatment of hangnails. Easily absorbable, vitamin E oil helps in softening and smoothening of nails by keeping them hydrated. Soak your fingernails in warm water for 5-10 minutes. Wipe them dry using a clean towel. Apply a thick layer of vitamin E oil on your nails. To hold in the moisture, wear disposable plastic gloves. Leave the vitamin E nail mask for 10-15 minutes. Wash off using a mild soap and lukewarm water. Repeat daily for two to three weeks. Vitamin E oil is a boon for those trying to get rid of ugly stretch marks scars on skin. Stretch marks are formed due to sudden stretching of the skin (tear in the dermis). Vitamin E oil penetrates deep down the second layer and heals the scars from the very root. It also helps in providing relief from itching and irritation that arises due to formation of stretch marks. Take a small amount of vitamin E oil on your palm. Massage on the affected area. Follow this regularly for a month. The antioxidants present in vitamin E oil help in improving blood circulation in scalp ensuring healthy growth in hair. The oil also helps in repairing damaged hair follicles thereby smoothening and conditioning the hair from roots to the tips. Take warm olive/coconut oil in a bowl. Puncture vitamin E capsules and extract the oil. Mix it with the warm oil in bowl. Massage on hair and scalp. The antioxidants in vitamin E oil contribute to prevention of tissue-corrosion that ultimately reduces premature graying of hair. Bearing excellent healing properties, vitamin E oil is helpful in maintaining the health of hair by restricting the growth of split ends. Take all the above ingredients in equal proportions. Apply this on your hair ends. In case of excess oil, pat dry using a lint-less shirt. Use twice a week for a month to see the results. Vitamin E oil helps in smoothening and strengthening hair cuticles, thereby reducing and preventing split ends and hair fall. Take 3 ounces of olive oil and coconut oil. Add 2 oz of vitamin E oil. This can either e used as a sealant or as hot oil treatment to cure splitting of hair. Regularly massaging your hair with Vitamin E oil leaves them shinier, healthier and smoother. A natural moisturizer, it contributes to conditioning of hair leaving them silkier than ever before. Take 1 teaspoon of vitamin E oil. Massage on to scalp and hair. Let it rest for 45 minutes. Repeat this every time before going for hair wash for a month to notice healthier, shinier and silkier hair.